With its trademark fleshy, crisp, rose stalks and deep green curly leaves, rhubarb (Rheum rhabarbarum) is probably the most popular pie plant in the English-speaking world. Rhubarb is a modest source of important nutrients such as B vitamins, calcium, manganese and potassium and a richer source of vitamins C and K. While the stalks are a good source of antioxidants, the roots of the plant boast laxative as well as blood glucose lowering properties. However, rhurbarb leaves are not edible, nor safe for consumption due to their high oxalic acid content. Oxalic acid is an antinutrient with toxic effects when consumed in large amounts. When ingested in large amounts, it affects normal kidney function, potentially causing kidney failure. Read more and find out what you need to know about your favorite pie plant. Is rhubarb a vegetable or fruit? As far as appearance, taste and botanical classification are concerned, rhubarb is a vegetable. But because of its extensive use in dessert recipes such as pies, crumbles, strudels, jams and so on, many people view it more like a culinary fruit. Because of its prolific spread in areas of favorable climate, rhubarb is very often seen as a weed. The stalks have recently gained popularity in juicing recipes because of their sour, but refresing taste which balances the bitterness in leafy greens commonly employed in vegetable juicing recipes. What does rhubarb look like? Rhubarb has quite a distinct appearance: it has reddish or rose, celery-like stalks called petioles with large, deep green, curly leaves on top. Remember: rhubarb leaves are not edible! They contain a toxic compound called oxalic acid which may cause serious kidney problems (kidney failure), if ingested in large amounts. For example, 19.23 g of oxalic acid is a lethal dose for a 50 kg individual. What does rhubarb taste like? Raw rhubarb is quite tart and acidic and tastes a lot like sour green apples. The green apple flavor comes from a compound called malic acid, also found in unripe fruits like apples or grapes. Despite being called a pie plant, the plant has an extremely low sugar content (1.1 g of sugar/100 g of rhubarb). In order to make it more palatable, sugar is added during the cooking process. While some people prefer rhubarb in desserts, others do not fancy it at all. However, there is a brave minority who enjoy eating raw, salted rhubarb stalks and find them more appetizing than a dessert. 1) Promotes weight loss. 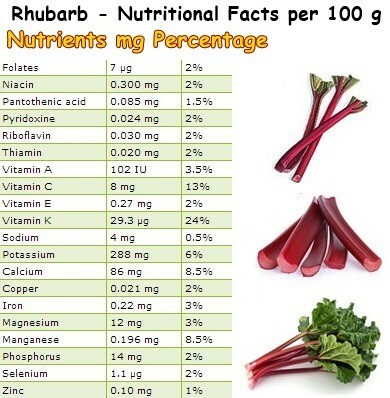 Rhubarb has only 21 kcal/100 g of raw stalks and a very low sugar content of only 1.1 g of sugar/100 g of rhubarb. This makes it ideal for losing weight, provided you consume it raw, roasted or stewed, without adding any sugar. Its high water content (93.61 g) and extremely low fat content (0.20 g) also contribute immensely to helping you keep your weight under control. 2) Good for cardiovascular health. Rhubarb has no cholesterol, no caffeine and less than 0.20 g of fat/100 g of raw stalks, thus contributing to artery health. Moreover, it contains 1.8 g of dietary fiber, indigestible plant material which prevents fat from the foods we eat from being absorbed by our intestines. This indirectly helps lower LDL (bad) cholesterol levels and makes rhubarb a heart-friendly vegetable. 3) Reduces inflammation and promotes bone and circulatory health. All of these health benefits are a result of the plant’s good vitamin K content (24% of the RDA). Vitamin K encourages blood to clot, preventing hemorrhaging by helping close wounds. Moreover, it contributes to strong, healthy bones and reduces inflammatory markers in the body, contributing to preventing chronic disease. 4) Good immunity and fewer colds. As you can see in the nutrition table above, rhubarb provides 13% of the RDA of vitamin C, a potent antioxidant, anti-inflammatory and antimicrobial agent. Having enough vitamin C in your diet is essential for good immunity, beautiful skin, low inflammation levels, healthy blood vessels and an overall better health. 5) Antioxidant activity. The trademark rose color of rhubarb is indicative of potent antioxidants called flavonoids which help protect cells and DNA against free radical damage. Moreover, the vegetable contains small amounts of another potent antioxidant called manganese, which our body uses in a sort of innate defense mechanism that protects against oxidative stress. Vitamin C serves the same purpose as well. 6) Wonderful natural laxative. Rhubarb roots and petioles (stalks) contain cassic acid (rhein) and emodin, two strong natural laxative compounds, highly efficient against constipation. Moreover, the plant has around 1.8 g of dietary fiber for every 100 g of stalks, adding to our daily requirements and encouraging regular bowel movements. 7) Lowers blood sugar levels. Preliminary studies suggest that rhubarb roots can help lower high blood sugar levels. Moreover, the plant is itself low in sugar which contributes to stabilizing post-meal blood sugar levels and prevent highs and lows that may impact productivity and wellbeing. Conclusion. Overall, rhubarb is a moderately nutritious vegetable with several great health benefits. Personally, I am not a big fan of it, but I am not giving up on it yet because I find it quite palatable in certain combinations. If you know of any good rhubarb recipes that will make me rethink this vegetable, I would really appreciate it if you could share them with me in the comments section below.